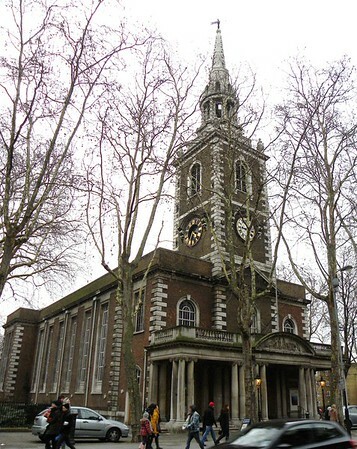 •	The Church of St Mary the Virgin is the historic parish church of Islington, the present parish is a compact area centred on Upper Street between Angel and Highbury Corner, bounded to the west by Liverpool Road, and to the east by Essex Road/Canonbury Road. •	The first recorded church building was erected in the twelfth century and was replaced in the fifteenth century. Before his consecration as Bishop of St David's in 1509, Edward Vaughan served as vicar. •	On 24 July 1738, the Vicar of St Mary's, George Stonehouse, invited Charles Wesley to "take charge of his parish, under him, as his Curate, he did not, however, possess any licence to do so from the Bishop of London. Wesley's journal lists many occasions on which he preached, and his regular praying at the church. •	Wesley's preaching proved unpopular for some and within a year he and George Whitefield were expelled from the pulpit at St Mary's. On 27 April 1739 he noted, "At Islington vestry the Churchwardens forbad my preaching: demanded my local licence. I said nothing but that "I heard them." Scions were very abusive; bidding me shake off the dust of my feet, &c.; and said, "You have all the spirit of the devil," mentioning Whitefield, Stonehouse, and me by name." From this point on Wesley joined his brother John and George Whitefield in field-preaching. Following a series of meetings with the Bishop of London, he decided to leave the city and to join his brother in Bristol during August 1739. •	A new church building was consecrated on 26 May 1754, designed by Lancelot Dowbiggin. •	In 1759, Philip Quaque, son of the Fante king Birempong Cudjo, was baptised at St Mary's, having attended the church with his brother for four years. He was the first black African to be ordained priest in the Church of England and returned to Ghana to minister as a missionary. •	The churchyard was enlarged in 1793, but with the rapid growth of Islington it quickly became full and was closed for burials in 1853. It was laid out as a public garden of one and a half acres in 1885. •	F. Donald Coggan, later Archbishop of Canterbury, served as curate from 1934-7. David Sheppard, later Bishop of Liverpool, played cricket for England while an assistant curate at Islington, 1955-7. •	On the third night of the London Blitz, at 10.20pm on 9 September 1940, a bomb destroyed the majority of the church, leaving only the tower and spire intact. The church was rebuilt following an appeal by the incumbent, The Revd Hugh Gough, and dedicated in 1956 when Maurice Wood was vicar. The architects, Seeley and Paget, created an ambitious design which attempted to create a space suitable for a "renaissance of evangelical worship".The main worship space is vast, with a volume of over 5000 cubic metres, and features deep clear windows which allow an unusually high amount of more natural light. •	In 1962, George Carey became curate and, among other innovations, pioneered links with local council departments and founded a new Boy's Club.